Uttarakhand Revenue (Rajaswa) Department has released the notification for the recruitment of Patwari and Lekhpal in all districts of Uttarakhand. Total 464 vacancies of Patwari and Lekhpal (Revenue Sub Inspectors) will be filled through recruitment starting from 5 October to 31 Dec 2015. Note : Vacancies may be increase/ decrease. An application fee of Rs 300 (for GEN) and Rs 150 (for others) will be payable through Demand Draft/ Postal Order in the name of District Magistrate (respective District). Selection for the Patwari and Lekhpal recruitment will based on Physical and Written test. A district level selection committee comprising DM, SP, CDO, SDM etc will supervises the selection process. Candidates can apply for Patwari & Lekhpal posts by sending application in prescribed format through registered post to District Magistrate Office (respective District) before 31 Dec 2015. 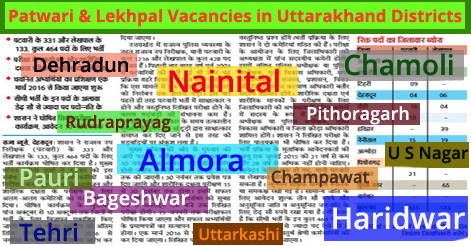 Help us to improve this article/job posting "464 Patwari & Lekhpal Recruitment in Uttarakhand – Syllabus & Schedule". We would be glad if you can comment below and provide your valuable suggestions and feedback. If this page have any wrong information/list or out of context content, then you can report us as well. Sir traing complete k bad direct joining h ? i want to know Chamoli is my home disctic can i apply in any other distric.or apply both district . Is the employmet card necessary.? What if , I don’t have the card,I will be elgible or not.?? Can apply online of patwari/lekhpal. If the possible of online process. Please earlier the process of online systems. female can apply and i am 28 year 2 month year old can apply? I am Virendra From Uttrakhand’S dist Pithoragarh I want apply for this post, can I apply online for that? can we apply both jobs for separate district ? i have completed graduation but i am just 20 years 5 month old can i apply. Sir.lakehpal ke liye phigical test ke bad hi age ke return test hona hoga. This side Anoop from kotdwara, pauri grahawal,guys i wanted to know about written test which will be happened after completion of patwari training. that would be very challenging time if incase written will not clear after training and i have another one question my date of birth is 1 july 1987 i.e 28 Year,0 Month & 0 Days. So can i apply for the Patwari post. Your reply would be very appreciated guys. I want to udham shingh Nagar. Sir Want to Udhanm Shingh Nagar……. Intermidiyt ke liye nahe hai kya ? After Training direct Joining this Post? Please Replay me. Is that any syllabus for written examination .? From where we collect this applicalion form… and can we fill this form online..?? i want to know Pauri is my home disctic can i apply in any other distric.or apply both district . Is the employmet REGISTRATION necessary without emp registration we can fill the form. Dear all, employment registration is compulsory before applying for these posts. I am presently serving in Assam Rifles as a Clerk and belonging to Bageshwar District. As per enrolment advertisment of Patwari and Lekhapal at Uttrakhand the vacancies of both not vacant in Bageshwar district. Sir/Madam I would like to know what I apply from other district of Utrrakhand and as well as what any relations are given to a serving person by the utteakhand govt. An early reply in this regards highly solicited for me. Main advertisement for Patwari Lekhpal recruitment will be published on 5 Oct. You can check all details here after 5th Oct.
Form will be filled offline after advertisement on 5th Oct.
Pls confirm the ege of patwari post & lekhapal post .can me apply author distt because my dist post is very low. Sir main ba3rd year pe hu to kya main apoearing pe bhar sakta hu. Yes, joining will be given who completes training successfully. tell about lekhpal that why physical process & tell about transparenty on this position. Give reply please fast. My age is going around 35. I have provisional degree of b.tech now. The original degree will issue in 3 months. So i can apply? Dear sir I have 12 pass and i am doing the B.A do i can apply this job please you give me answer thanku. i have done polytechnic in computer science engg in 2013 and inter pass so i can apply for this recruitment..
sir could u plzzz tell me….can female apply for dis post? District wise notification kab aayegi plz tell me?? Hi everyone is anyone know about the age relaxation for OBC candidates for both Patwari and Lekhpal vacancies. Please do let me know about the age relaxation in uttarakhand state for reserved candidate. sir female ye form bhar sakte h kya…..
Website pe to online ke liye koi advertisement nahi h…what to do..?? Employment registration is necessary for this post. Female can also apply this form plzz rply me sir I’m 24 year old and I have done my graduation. Yes, you can apply for Patwari & Lekhpal Recruitment. I m just 20 yr and 6 months old and I am student of b.sc final yr.
Sir,Ex army ke liye education Qualification kya hai.police SI main to 12th tha. 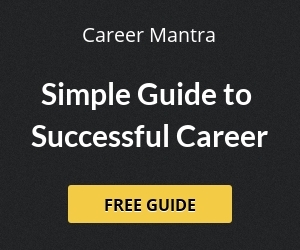 No, this post is only for Uttarakhand candidates. Champawat district ke liye advertisement kab aayega??? Yes you can apply from any district but one person can apply only for one post. Please provide me application form online. Application format is available separately in district advertisements. kya yahan v ghoos chalegi sir…..
ye prosess galat hai distic ko hata kar direct recruitment kyon ni nikaal dete ..or jo select ho use priority k anushar distric chunna chahiye….is tarah se berojgaron main ek sanshay bana hua hai … or berojgaron ko iska arthik nukshan uthana padta hai ..mere anushar is par aapko sochana chahiye .. ek to berojgaar uper se peson ka nuksan..
Sir my question is can we apply for other district rather than ours. Like I am from district Dehradun but I want to fill up the form for seat in Haridwar district. Respected, Sir/Madam I want to know age limit for OBC candidate of Lekhpal in (Udahmsingh Nagar) Uttarakhand. Sir I have the marksheet of BA diploma still not arrived. The problem is not so. can i apply foe the post?? pls mujhe ye bataiye ki in dono vacancy k liye kaise apply kr sakte hai offline ya online ya dono tarah se yadi online suvidha nahi hai to application form kaha se milenge ,pls reply me soon as soon. sir yeh kis tarah ka process hai jahan candidates ko apne kharch par training fees deni hongi jo berojgaar hai unke saath yeh kaisa mazaak. Plz intimate is there any age relaxation for the persons serving in the army or any quota available. Yes, female can join lekhpal too. I am Abhishek Verma, I want to know that physical test is for patwari only or in both patwari/lekhpal….??? I have completed my graduation but did not made my degree certificate from my university. GHOOOSH Bhi chal rhi hai kya?? kitna dena pdega? koi jugad bhi hai kya ? Sir kya ex-serviceman can apply for the post. Thank you sir ..is Bharti ka bhi hall Uttarakhand SI wala hi kar denge aap log …..no fix date no fix time …1 bharti ko 2 saal late kar doge aap log . Currently i done my MBA(marketing) i all my education knowledge and extra activety knowledge utilize in you work place.. Please inform that when lekhpal admit card download. any one know the expected date for ARO main exam..
Employment reg in uttrakhand is must, if you do’t have it. u can apply the same online. in that case u have required domocile/Mul Nivas certificate. So, Pls make your Mul Nivas Certificate fist. HOW CAN I KNOW THAT MY FORM IS ACCEPTED OR REJECTED? how can i know that my form is accepted or rejected plz.tale me. Is dere anyone who knows about admit card of lekhpal…. sir lekhapal ke physical test me kya kya hoga? or kiya kiya hoga document sari lane padenge kiya .ye jankari reply kar de . is patwari written has postpond??. if yes. so whats the date of written test?? Sir when will written exam for lekhpal will be held , if this’s postponed then what the next date. Waiting for reply eagerly. Sir I WANT TO FILL FORM IN 2017 PLEASE TELL THE DATES FOR FORMS ARE COMING IN YEAR 2017. Patwari ka paper kab hoga . please send me on my e – mail add. Sir, when will written exam for lekhpal will be held , if this’s postponed then what the next date. Waiting for reply. Sir, when will written exam for lekhpal will be held , if this’s postponed then what the next date. Waiting for reply. Pls send me the details in my mail. Sir id’t HV admit card .. But my physical test hcv paasd ..
Lekha pal or pateari ka result kab tak aa sakta h? Udham singh nagar se lekhapal ki cutt of kitni jayegi GEN ki? 135 m koi chance h kya gen ke liye? Patwari/lekhpal training schedule of Oct 2016 passed candidate almora . training dates kiya hai?? ?